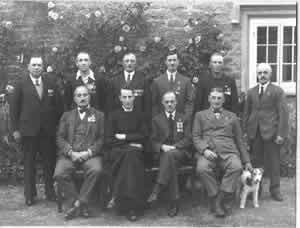 In 1921 the British Legion was founded by Field Marshall Earl Haigh. The organisations purpose was to help needy ex-servicemen financially and to restore their self respect by providing employment. Committee Members:- Messrs. Elton, Cammell, Nethercott, Hawkins and Brown. Major J.M.B.Wratislaw, Rev. A.R. Dittmer, R.B. Howarth and A. Hackett plus dog! In 1938 the Women's Section was formed under the chairship of Mrs. Green. Since that date and through the various wars that have taken place but the local branch has continued for another 60 plus years.